Colorado School of Mines students worked on their concept for the Mars Ice Challenge on June 14 at NASA's Langley Research Center. While Mars has water ice beneath its surface, extracting the liquid for future human missions will be a challenge. A recent NASA competition tasked university student teams to mine simulated Martian subsurface ice. 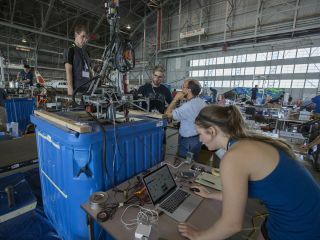 The RASC-AL (Revolutionary Aerospace Systems Concepts – Academic Linkages) Mars Ice Challenge took place between June 13 and 15 at NASA's Langley Research Center in Virginia. "NASA has really been focused on trying to get all the pieces in place to get to Mars," Richard Davis, assistant director of science and exploration at NASA's Science Mission Directorate's Planetary Science Division, said in the statement. An October 2016 study indicated that Mars boasts a deposit of subsurface ice that is likely larger than New Mexico, providing a valuable source of water for future colonists on the planet. "There's a lot of resources on Mars, but water is the driver," Davis added. "There's a ton of water on Mars." The students' task was to drill through about 16 inches (0.5 meters) of simulated Martian soil (regolith) to get to solid ice blocks that were about the same depth. Each team used a combination of drills, augers and an excavator to get the work done. The students also submitted a technical paper discussing how their system could be used on Mars, considering the planet's different gravity and environment from Earth. To make sure they were working within real-life constraints, the students had to be mindful of mass, volume and power restrictions that are common on Martian missions. The students were further warned that during a real mission, drills would have to work for months or years in a cold and challenging environment. Martian gravity is only about 38 percent the strength of Earth's, its atmosphere is thin and largely made up of carbon dioxide, and the surface is baked in radiation, among other challenges. "It's all about learning and adapting," Patrick Troutman, human exploration architecture integration lead at NASA Langley, said in the same statement. The projects are "based in reality to what NASA wants," added Shelly Spears, director of education and outreach at the National Institute of Aerospace. The institute administers the event. "When we give those challenges to students, they're able to start solving them in their unique way," Spears said. The Mountaineer Ice Drilling Automated System from West Virginia University in Morgantown took home the win. "Engineering really prepares you for this stuff," said Eric Loy, a team member. "It's just problem solving." The full list of competitors included two teams from West Virginia University, and one team each from the Colorado School of Mines in Golden, the University of Pennsylvania in Philadelphia, the University of Tennessee in Knoxville, North Carolina State University in Raleigh, the University of Texas in Austin and Alfred University in Alfred, New York. Langley held the Mars Ice Challenge as part of its centennial celebrations. The center was the first civilian aeronautics laboratory in the United States when it was established in 1917. Langley was created under the National Advisory Committee for Aeronautics, which was reformulated as NASA in 1958.